If you were to do a survey of which features were the most popular among slots players, we would pretty much be able to guarantee that free spins would be at the very top. There is nothing more satisfying than landing a ton of free spins and just sitting back and watching them reel in the wins. With that in mind, have you ever wondered which online slots give you the chance at unlocking the most amount of free spins via their bonus rounds? Well if you did, you can thank us later as we have put together a list of ten of the very best online slots with the most free spins in their bonus games. 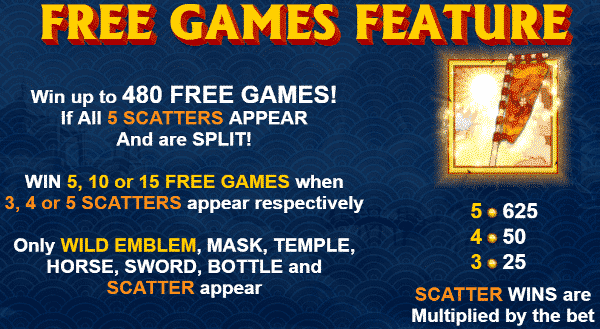 Sitting right at the top of the list when it comes to the maximum amount of free spins that can be won on a slot machine is Samurai Split by NextGen Gaming with this featureful 25-payline slot offering players the potential of landing themselves a staggering 480 free spins. 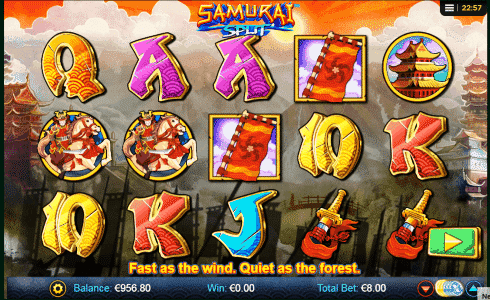 Themed around those famous Japanese warriors and their ultra-sharp Samurai swords, this slot comes with additional features such as wild symbols and scatter symbols. Those free spins will be the bonus feature most of you will be trying to unlock however and doing so will mean you will have to land the ‘Flag’ scatter symbols at least three times on the reels after a spin. Three of them will get you 5 free spins, four will unlock 80 of them and you will need 5 if you want to enjoy that magnificent 480 free spins. If you prefer to play on 720-ways-to-win slots but do not want to miss out on a good number of free spins, Siberian Storm by IGT is going to be the online slot for you. Siberian Storm will certainly keep you happy as there is the potential to unlock as many as 240 free spins should you get lucky enough. Initially, you can be awarded up to 96 free spins in the base game when you land five of the ‘Tiger Eye’ but during that free spins round you get an increased chance to add even more of them which could see you land that maximum 240 free spins that the slot has to offer. 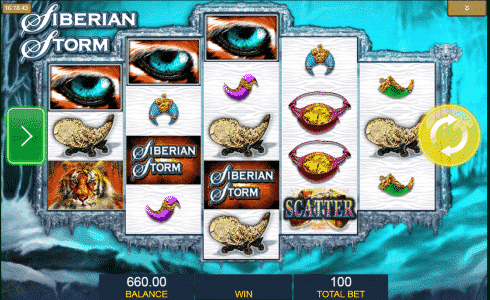 Siberian Storm is a hugely popular slot at the online casinos and it has to be said that these free spins are a big reason for that popularity. more can be added to get you closer to that maximum amount. 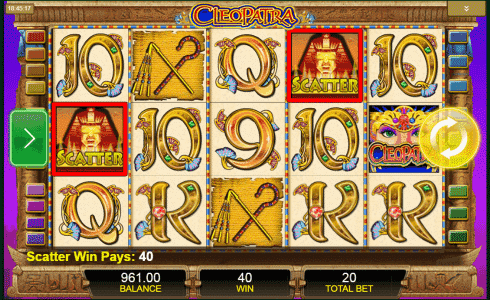 Cleopatra is not only an enjoyable slot because of those free spins as you can also benefit from other bonus features on the slot such as wild symbols, multipliers and scatter symbols too. In fact, with a jackpot of 10,000 coins up for grabs from the base game, you might not even need to rely on those free spins. 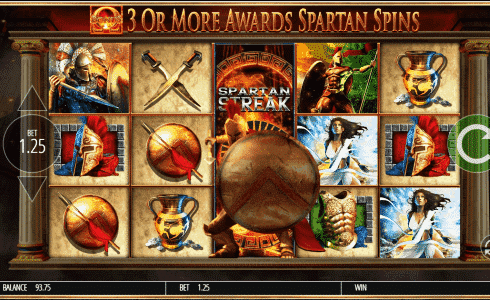 Fortunes Of Sparta is a superb 25 pay lines slot machine from Blueprint Gaming. The Spartans were a brutal warrior society in ancient Greece (431-404 B.C.). The game graphics are outstanding on Fortunes Of Sparta and in our opinion the most exciting slot on this top 10 list. When playing the game you can win up to 100 free spins, this is really a top online slot machine, and when we tested the game, it was so fun, so we actually played for hours. You can play spins for as little as $€£0.25, and if you like to play big, the maximum bet is $€£125 per spin. The game also has a very high 97.04% RTP. Fortunes Of Sparta is for sure a must try slot machine. Kronos is another online slot that is popular among players and we have a feeling that the potential for 100 free spins will be one of the major reasons behind this. Developed by WMS, Kronos is quite an old slot now having been released back in 2013 but it still offers more than enough to hold its own against more modern releases. 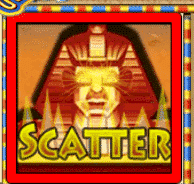 The action is played out across 20-paylines and as well as the free spins which are unlocked when you land 5 of the scatter symbols, you will also be able to expect features such as stacked wilds and scatter symbols. Rainbow Riches Reels of Gold is another excellent option if you are looking for an online slot that has a good number of free spins for you to enjoy. As many as 100 free spins can be won in this slot and when that happens you can be pretty damn sure that you are going to earn yourself some good payouts. 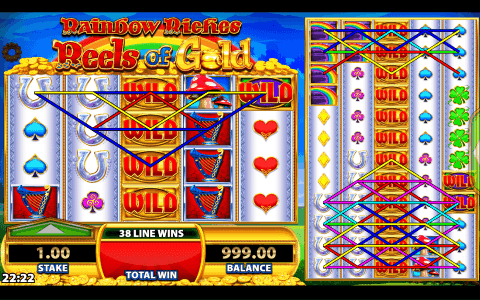 Developed by WMS, Rainbow Riches Reels of Gold does not stop there either as you will be able to witness various types of wild symbols such as stacked wilds, magic wilds and wild bursts while other features like multipliers and a bonus game will add to the entertainment as well. 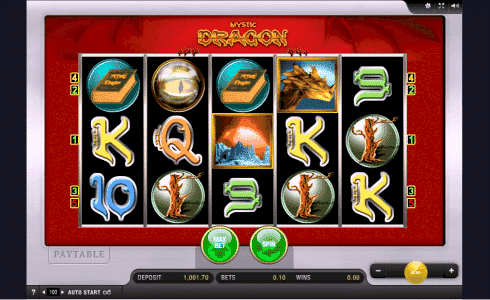 Another online slot with 100 free spins is that of Mystic Dragon by RTG. Here you will a combination of good bonus features, quality graphics and plenty of entertaining gameplay but of course, it will be the free spins that you will be hoping to see more than anything. What is great about the free spins round on Mystic Dragon is the fact that you will have stacked wilds helping you along the way as those spins roll out. This gives you far more potential for some handsome wins. There are plenty of other good features for you to enjoy on Mystic Dragon too – but it is a RTG game, and they do not have the best reputation. 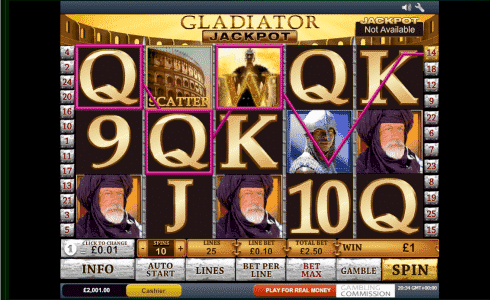 This is not to be confused with the slot of the same name by Playtech and is actually the Gladiator slot that was developed by Microgaming. It has 50-paylines, the sort of top-quality you would expect from Microgaming and more importantly, 100 free spins that could be unlocked. As with many other slots on this list, the games scatter symbol will need to be found anywhere on the reels at least five times for those spins to come your way but once they do, you can sit back and watch the reels spin and the wins being credited to your account. 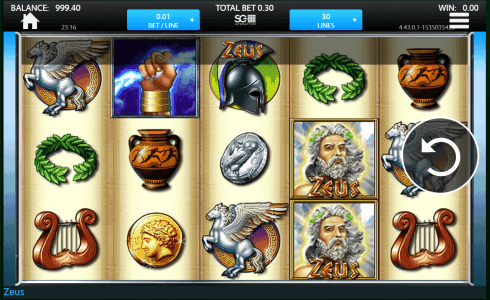 Zeus by WMS Gaming is another online slot that is worth checking out due to the handsome number of free spins that it could give you. Themed around Greek mythology, this slot has always been a popular one at the online casinos and with the potential of landing 100 free spins, it is easy to see why. Zeus offers plenty of other good bonus features for players to take advantage of but it is those free spins where the big money is going to come from. The slots scatter symbol is once again responsible for winning you these free spins with 5, 25 and as many as 100 on offer. You can even retrigger even more free spins from within that round so technically, you could get even more than 100 in total. 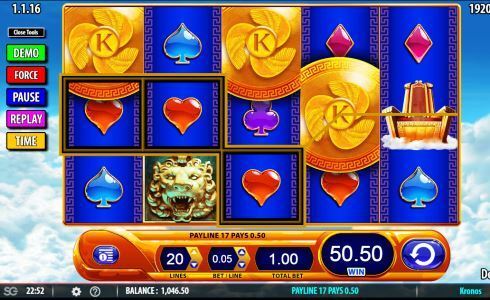 You can also look forward to good graphics and a bunch of other enjoyable features on this 5-reel, 30-payline slot. Is there a better combination than beer, slots and free spins? We highly doubt it, especially when you could enjoy as many as 80 free spins on this 5-reel, 40-payline slot from WMS. Themed around a German-style pub, Bier Haus provides a colourful slot experience as well as a number of excellent bonus features including that of a free spins round that could see you enjoy the winnings from as many as 80 free spins. Among those other features that you will find on this includes shifting wilds, locked wilds and scatter symbols. Free spins will always be one of the most popular bonus features on slots – simply because people love nothing more than getting something for free. This type of feature is usually one of the more lucrative as well as it is rare to come away from a session of so many spins without recording some healthy profits. The ten I have listed above are the ones with the most free slots spins we where able to find, but we are sure you will be able to find a few others for yourselves as well. If we should choice a favourite one it would be the new slot Fortunes Of Sparta, can be played at VegasParadise.com. Don’t forget to let us know if you think we might have missed any!